At last, computer hobbyists and business people alike can take their Ataris and get down to real business. Personal computers have now been around long enough for most of us to be on our second- or third-generation machine. Because of this proliferation and overwhelming acceptance of computers, software authors have been extremely busy writing application software which can take advantage of the ever-increasing capabilities of our new machines. Join me in a quick trip back in time, before we explore the possibilities before us today with our Atari STs! In 1983, I bought my first Atari 400 computer with 16K of memory because a friend of mine had one—and I thought that Star Raiders and Crypts of Terror were the greatest games I had ever played. Also, he lived about 25 miles away, and the late night drives were getting tedious (too much downtime); so I needed one in my own home. From that point on, I was hooked on the hidden power of these amazing machines, and more importantly, on what they did and could do. Since that time, we have seen changes equivalent to the transition from horse and buggy to the automobile. 16K? 48K? 8-bit machines? Now the Atari STs are bringing new meaning to the word "Atari." Ah, remember, just a few short years ago. But today, we have super computers that are faster, more powerful, versatile, able to store data in a single bound, and the software has been keeping pace with the rapid advancements in hardware technology. In this article, I will not speak of specifically named software packages. Rather, I will explore the world of possibilities of business applications. Fasten your seat belts as we hyperspace from Star Raiders to serious business. 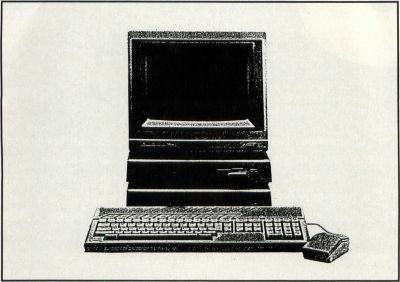 Computers were first seen as useful business tools when the VisiCalc spreadsheet was introduced. For the first time, the number-crunching was done for you; recalculations happened quickly and without the need for erasers, and "what if' modeling was a snap. Cash-flow analysis, costing of goods and services and financial planning were all made easy with this electronic spreadsheet. Whether you run a mail-order business or a doughnut shop, numbers are your game and computers make it easier to win. Truly, electronic spreadsheets helped legitimize these strange new machines. Word-processing software followed quickly behind, offering new vistas of possibilities to large numbers of users for document processing without Liquid Paper. Imagine, correcting mistakes right on a CRT, before ink ever touches paper! In fact, probably 60% of all the computers which are targeted for business are used for either spreadsheets or word processing. Database management (DBMS)—keeping track of names, addresses and other more sophisticated information—ceased to be a Herculean task, and DBMS software became available. Graphics were a natural addition, then telecommunications and integrated packages that did some of everything. And now there's desktop publishing! Naturally, the market for specialty software grew constantly: money management, real estate, stock portfolio managers, etc. There are thousands and thousands of titles available in these categories. When you take a step back and look at what really is available in the software market today, you can be overwhelmed at the number of software offerings, the number of companies publishing the software and the number of retail or mail-order sources to purchase what you select. Critically, when business is your business, you want to invest in software that will: 1) Do the job you need done; 2) do it reliably and with as short a learning curve as possible; and 3) be cost-effective. Out of these three requirements, No. 1 demands the most attention. Before the purchase of any business software, outline on paper the desirable goals that you hope to achieve by purchasing the software. Remember, software is a solution to a need, so spend ample time defining and refining your needs through a comprehensive needs-analysis. Once this thorough soul-searching is completed, you can begin to entertain the thought of finding the software that will match or exceed the defined criteria. Do not be afraid of buying software that does a little more than you need to do. Plan on growth, including your knowledge index of computer software. Software packages that allow you to grow with them are the most desirable, since you will not likely outgrow their usefulness in a short time. Begin by listing the things you need to do, and define them by categories. For example, a friend of mine had a mail-order business at one time, and I suggested that he would need to track the names and addresses of all his customers, send out occasional product offerings to them, track the financial picture of the company by doing some cost-accounting, etc. Immediately we can see a need for a database product, a word processor and a spreadsheet. In another example, I had a manufacturing business which designed and marketed children's apparel. We needed to do all of the above, and in addition, upload (or send by modem) our cutting orders to the remote factory we contracted with in Texas. So we needed, additionally, telecommunications software so that we could send information over the phone lines to another remote computer 1,200 miles away! After you have exhausted the list of tasks that you need to accomplish to operate your business more effectively and efficiently, you must look at the overall software picture Computers are supposed to save us time and be more efficient than we can be. Therefore, data integrity is a critical, but oftentimes overlooked, subject of inquiry. By data integrity I mean simply this: Once you have keyed in information into one of your software selections, you want to be able to use that information later, whether it's database management that you're doing, word processing, financial analysis, etc. It happens too often that a business does not plan ahead for this variable. Therefore, you must look for software that works together. Oftentimes, a single software publisher will make offerings in all major categories. The hook, as I call it, is that the products work together. For example, the names and addresses that you have spent two days inputting into your database can now be merged into a letter that you are sending out to all of your clients—merged seamlessly into the document to give it that custom-written look. Any piece of data from your database can then march across the bridge to the printed page inside your letter. By putting the proper code in the body of your letter, you can customize each letter as if it were individually written for each customer. This adds a personal touch that means a better company image and increased customer service. Likewise, statistical or financial information that you have in your spreadsheet can be moved or used in your letter to your lending institution, to show them how well your business is doing. Avoid the trap of buying business tools that do not contribute to the overall accomplishment of the project. Years past, software publishers concentrated on putting out individual products which worked well, in a single environment. Today, the software movement is to see a software application as an "integrator" that is, an environment in its own which allows other data to exist in a variety of other formats, yet still be compatible with it by allowing importing and exporting of other files. Now the buzzwords are document processing, desktop publishing, database publishing and so on. Remember that the whole purpose of software as a business tool is output—output to the screen, to a dot-matrix printer, letter-quality printer, I laser, plotter and so on. The business person wants to see and use the data for financial analysis, charting or graphing, mail-merges, presentations and consolidation documents that utilize data from a variety of sources. A final business-application document might require data from a remote computer, might need to represent that data graphically and in speadsheet form, might need to send that information to a number of business contacts (bankers, venture capitalists, investors, partners etc. ), and might look best if its final layout integrated this data in a single document with special effects like different font styles, columnar format (like a newsletter), graphics and all mixed onto a single page or series of pages. When planning your business needs, plan for today and the future. Strategize on what you need now, and what you are likely to need as your business and your business requirements grow. Go for it! Your best source for information about individual software packages is independently written reviews, as you see in this magazine. Of course, if you have a business acquaintance or friend who can fill you in with the details, that is wonderful too. Your retailers can also be of assistance, if selected carefully. Some dealers are full-service dealers, where you may pay a little more for the product, but will get expert guidance and the ability to "test-drive" the software before buying it. Also check SIGS (Special Interest Groups) on bulletin boards such as DELPHI, CompuServe, The Source and so on, for ideas, suggestions, and answers to any specific questions that you may have. There's price and then there's cost. We should all be concerned with cost. And here's the difference. Price is something that we are definitely concerned with when we are buying the product. Cost is something that is a concern for the life of the product. If you save a little on price when you buy, but realize several months later that the software is not doing the job for you, you will have lost all of what you spent on that product when you have to replace it. Therefore, your cost has just gone up tremendously. On the other hand, if you spend a little extra on the product that will do the things you need to do and in the future, though you may spend a little more on the price of the product now, the life of the product doing what you need to do will be longer, and your cost will be less. Be careful. Good deals are only good if the product you receive does what you expect it to do. And keep in mind always, the discussion of "software as integrator." You want to use that data over and over again (data integrity) without rekeying it. The old adage is true, once again: "Plan your work, then work your plan." Writers: I absolutely enjoy writing articles and software reviews. There are many of you out there who enjoy writing as well. In fact, working at home is becoming so popular because of the locations of main offices, traffic congestion and so on, that many people who are on payrolls of magazines and newspapers work primarily out of their homes. Many of these writers use their favorite word processor (or the favorite of their employer), research their articles through the growing number of information databases available online today, write them at home and then upload their articles to the company's computer at headquarters. Word processing and telecommunications software play a big role in their financial security. Independent writers who write in their spare time oftentimes have the same option. Newsletters: As you are all aware, there is an ever-increasing number of professional newsletters being published now. Financial newsletters, stock and bond newsletters, newsletters for collectors, car enthusiasts, stock clubs, golfers, boaters—you name it, and you can find a waiting crowd to purchase a quality newsletter on the topic. Almost every category of software can be used in the publication of newsletters, from desktop publishers (the obvious choice) to word processors for the heavy-duty writing, graphic packages whose image files can be exported to the desktop publisher, to databases to merge subscribers and more. Mail-Order Business: A computer is perfectly suited to help run a mail-order business, with a database tracking customer information, including favorite items or other preferences; and a word processor to maintain continuous contact and ' merge with the database for special mailings to those customers who have a special interest. You can track your vendors, prices, availability of goods; your spreadsheet will help analyze cash flow, and so on. You may even want to publish a monthly or quarterly newsletter for your customers. The possibilities are endless. Real Estate: Again, your Atari ST can help you run your real estate business more effectively. Track the cash-in and cash-out for the buildings you own; use the database and word processor to keep in contact with your tenants. When I was looking to buy a home, I tracked the asking price and sale price of comparable homes in the area for about six months prior to purchasing, and tracked the percent-variance between asking and selling to help me make an offer the buyer couldn't refuse! Similarly, if you are looking to purchase investment properties, you can apply the same principle and put the software to work in the same way. When you are wondering how to make the transition from super-sophisticated games and educational software to genuine business software that can meet and exceed your needs, crank up your Atari ST one more time, and put its business savvy to the test. Or if you are in the market for a computer that can do it all, look into the Atari ST line. For your business needs, the Atari STs can really "get down to business!" Let me know how you use your STs. Write to me care of ST-Log. In the meantime, I'll be waiting and writing!